Roboform AI is an add on for Internet Explorer and Mozilla Firefox. It stores all you passwords, logins, and personal information. When installed the program will take you though a tutorial process where it asks you to input your information. After this is done all you have to worry about is saying yes or no to storing new logins. Roboform features a master password which wont let you auto-fill you information unless you input that password. It can a convenient or inconvenient feature depending on what your preferences are. 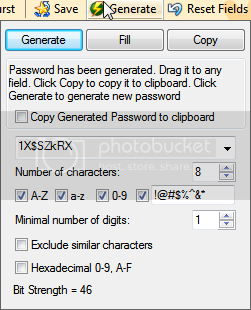 It also includes a nice password generator which can be set to different strengths. So all-in-all Roboform is a program worth paying the money for. If you would like to go ahead and check out Roboform's home page. oh technewsweek.blogspot.com, I think I might want your external hard drive..